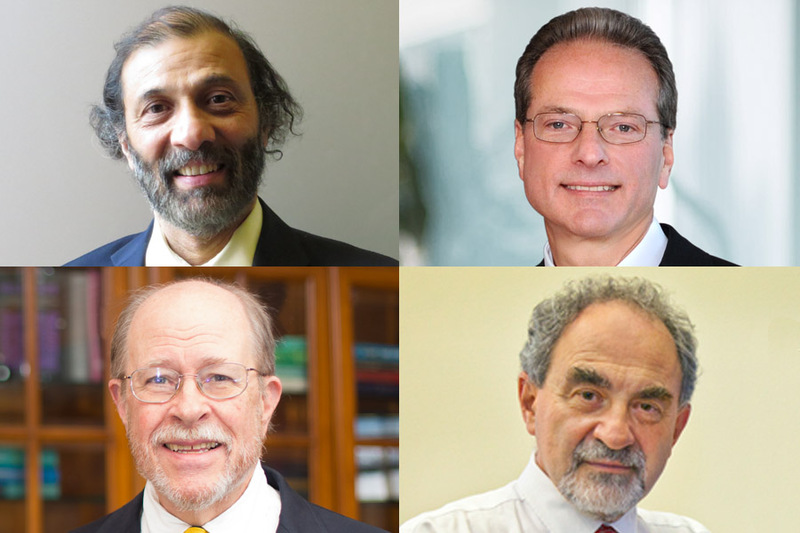 Photo, clockwise from top left: Subramanian Iyer, Henry Samueli, Alan N. Willson, Jr., and Eli Yablonovitch. Four faculty members affiliated with the UCLA Henry Samueli School of Engineering and Applied Science have been elected fellows of the National Academy of Inventors – Subramanian Iyer, Henry Samueli, Alan N. Willson, Jr., and Eli Yablonovitch. The non-profit organization announced this year’s class of 155 fellows on December 12. The prestigious honor is given to academic inventors who have, “demonstrated a prolific spirit of innovation in creating or facilitating outstanding inventions that have made a tangible impact on quality of life, economic development, and welfare of society.” New fellows will be formally inducted into the academy in April, at the organization’s annual conference in Washington, D.C. All four new UCLA fellows are members of the Electrical and Computer Engineering Department. Subramanian Iyer is a Distinguished Chancellor’s Professor and the Charles P. Reames Chair in Engineering. He leads the Center for Heterogeneous Integration and Performance and Scaling (CHIPS), a consortium based at UCLA that aims to lead paradigm shifts in the design and manufacture of integrated circuits and systems. Iyer joined UCLA in 2015, following an accomplished career at IBM, where he was an IBM Fellow and the director of the company’s System Scaling Technology Department. His honors include the IEEE Daniel E. Noble Award for Emerging Technologies. He is a fellow of IEEE and the American Physical Society. Henry Samueli co-founded Broadcom Corporation in 1991 and currently serves as Chief Technical Officer of Broadcom Ltd., a global leader in providing semiconductor solutions for wired and wireless communications. He has received several international honors for his contributions to communications including the Global Semiconductor Alliance Dr. Morris Chang Exemplary Leadership Award and the Marconi Society Prize and Fellowship. Samueli is a member of the National Academy of Engineering, and a Fellow of the American Academy of Arts and Sciences and of IEEE. The engineering schools at UCLA and UC Irvine are both named in his honor, commemorating his landmark gifts to each university in 1999. Samueli earned his bachelor’s, master’s, and doctoral degrees from UCLA, where he holds a faculty appointment. Alan N. Willson, Jr., professor emeritus, has made pioneering contributions in digital signal processing. He was the inaugural holder of UCLA’s Charles P. Reames Chair in Engineering. Earlier this year, Willson was named the 2018 recipient of the IEEE Gustav Robert Kirchhoff Award, which honors individuals who have made significant impact in any area of electronic circuits and systems. Willson has also received distinguished honors for his teaching, including the IEEE Leon K. Kirchmayer Graduate Teaching Award, and the George Westinghouse Award from American Society for Engineering Education. Willson is a member of the National Academy of Engineering and a fellow of IEEE. Eli Yablonovitch is a professor of electrical engineering and computer sciences at UC Berkeley, where he holds the James & Katherine Lau Chair in Engineering. Yablonovitch has made pioneering contributions in optoelectronics and photonics. He holds an adjunct appointment at UCLA, where he was full-time faculty member from 1992 to 2007 before moving to UC Berkeley. Yablonovitch is a member of the National Academy of Engineering and the National Academy of Sciences, a fellow of the American Academy of Arts and Sciences, and a foreign member of the Royal Society of London. He has received numerous distinguished honors for his research, including the 2018 IEEE Edison Medal and the Isaac Newton Medal from the Institute of Physics in the U.K. Previously elected fellows of National Academy of Inventors with UCLA Engineering faculty affiliations include: M.C Frank Chang, Tatsuo Itoh, James C. Liao, Asad Madni and C. Kumar Patel.